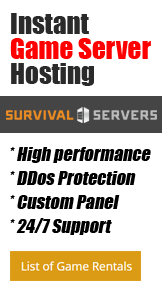 Welcome to the official SurvivalServers.com Wiki! How to: Control Panel - How to use the custom made, exclusive SurvivalServers Control Panel. How to: Modify Server Config - How to use the custom made SurvivalServers Modify Server Config tool. How to: Invoice and Order Management - How to manage payment, auto-payment, change games, or stop your service. Control Panel FAQ - Have a question about the control panel? Check here first! FTP Access - How to connect with FTP and what can you do. Database Backup and Restore - How to backup and restore your server data. Support Ticket - Need help? How to submit a support ticket. FAQ - Frequently Asked Questions. Got a question? Check here first. Steam Server Favorites - A quick guide on how to add a server to your Steam favorites. ARK: Survival Evolved Server Start Guide - Getting started? Here's what you can do! ARK: Survival Evolved Advanced Configuration - Want to push your ARK server even further? ARK: Transferring Singleplayer data to Multiplayer - Have a singleplayer game that you want to show off to your friends? ARK: Custom Launch Parameters - How to setup custom maps, Primitive+, and other modding / overhaul features. ARK: Popular Mods - Want to spice up your server? Check out an example of popular mods available from the Steam workshop! Arma 3 Epoch - Information related to Arma 3 Epoch. DayZ Epoch - All information related to Epoch. Arma 3 Exile - Information related to Arma 3 Exile. Arma 3 Exile Infistar - Information on how to install Infistar. Arma 3 Altis Life - Information related to Altis Life mod. Arma 3 Wasteland - Information related to Wasteland mod. Arma 2 Epoch/Overpoch - Information related to Arma 2 mod. Server Settings - Adding descriptions, header images, URLs, and more. CPBO - Unpack / Pack your server and mission PBO properly. Dart - Easily connect to server rcon and kick/ban as well as global admin messages. EPM - Easy to use rcon tool for Arma 3 and Arma 2. Allows for kick/bans and global admin messaging. Gotcha - Advanced admin controls, click for more info. PboManager - Unpack / Repack your server and mission pbo files properly. McRcon - Rcon tool for connecting to your Minecraft server. Arkon - Rcon tool used for remote admin of ARK/PixARK. Notepad++ - Handy file editing tool. The following policies apply to all paid custom mod orders. All mods can only be applied to one map type. For example: you cannot change the mods from Chernarus to Panthera or Taviana. This is because the mods must be redone for each map one by one. There is a 30% fee of the original cost of ALL mod orders to upgrade them to the newest version. For example upgrading from Epoch 1.0.5.1 to 1.0.6.2. This is because new server files are generated and we must manually transfer mod work. Customers can transfer mods between server locations like Dallas to Germany or Seattle. In order to do this, log into FTP and make a backup mission and server PBO from within your @DayZ_Epoch_Server addons and MPMissions folder. It is not possible for anyone to instantly transfer custom DayZ server modifications from one version of Epoch to the new version. This is because installing the update generates a new server and mission file (PBO files). It is not possible for any DayZ server host to offer an instant transfer of custom mods from one update to the next because the mods must be redone one by one. Customers are allowed to transfer the mods over themselves, but this requires unpacking the new PBO's and manually inserting custom code from the old PBO's straight into the new ones. We cannot offer this service for free due to amount of time it takes to test and apply mods to a single game server. This is strictly a paid install service for the time it takes to install the mods. We price according to the amount of time to install, with a minimum fee of $10.00 for any addon / mod. All credit for the creation of these mods goes to the developer.